Nearly three lakh people in the Kuttanad region are struggling to keep their nose above water. Literally. KAINAKARI: Kainakari, with its splendid backwaters and paddy fields, has caught the imagination of nature lovers world over many a time in the past, but lying under muddy water for nearly one-and-a-half months, almost everybody seems to have turned a blind eye to it. It is the case with almost all the villages in the Kuttanad region, where nearly three lakh people are struggling to keep their nose above water. Literally. “This is the worst flood to have affected Kuttanad in my memory. The people living in the interior area of paddy polders are hit really hard. 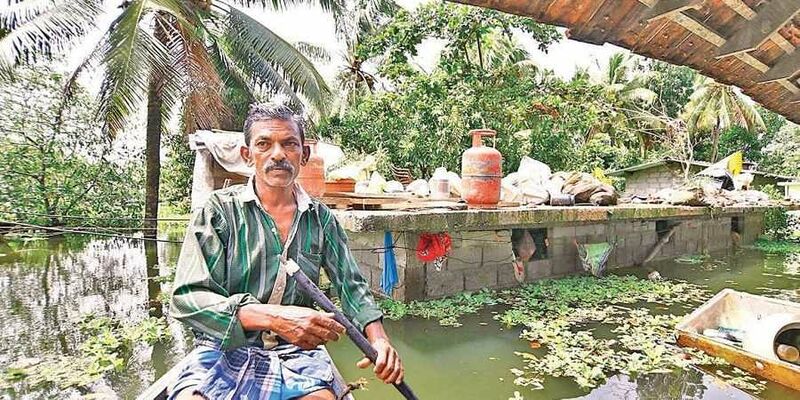 Most houses are under six-seven feet of water,” said Sudarsan, 60, of Thekkechavara, Kuttamangalam. If only strong outer bunds as suggested by the MS Swaminathan Research Foundation had been in place, Kuttanad wouldn’t be drowning in sorrow right now. As the rice bowl of Kerala grapples with one of the worst floods in history, the contrast is stark. Houses and fields protected by strong outer bunds escaped nature’s wrath, while those that lacked permanent bunds were breached. According to Vavakkad resident Ratheesan, the absence of strong bunds is the reason for people’s plight. “Some of the paddy polders were constructed with strong outer bunds under the Kuttanad package and they survived the heavy flood. More than 350 houses in the Vavakkad South paddy polder are protected with outer bunds. So, the solution to the problem is the construction of permanent outer bunds. The paddy polders of Naduthuruth, Irumbanam and Vavakkad South survived because of the strong bunds constructed a few years ago,” he said. However, Vavakkad resident Sasiyamma was not so lucky. “Thanks to the hard work of my daughter who is in the Gulf, I had built a house two years ago. But the breaching of the bund has dashed all my dreams. My house has been destroyed and household items washed away,” she said. People affected by the flood complained that officials were denying relief citing various reasons. At the same time, official laxity and legal tangles are delaying distribution of relief materials by the Civil Supplies Department. Kochukattuthara resident Shaji lambasted the attitude of people’s representatives. A fishing trawler with four fishermen on board was reported missing off Lakshadweep on Sunday. The Coast Guard is said to have deployed a Dornier aircraft as part of the mission to locate Farhana and Samudra Prahari was diverted to the vessel’s last recorded position. Separately, the Navy sent out search boats, along with local fisherman, to expedite the relief and rescue mission. A Naval Dornier aircraft also joined the search party by noon. INS Sujata has been diverted to search the area, which is expected to arrive late on Sunday evening. Strong winds from mainly the westerly direction, with a speed ranging between 35-45 kmph and 55 kmph, are likely to hit along the Kerala coast and over Lakshadweep area for the next 24 hours. Sea condition will be rough to very rough along the Lakshadweep area and in the southwest, central and north Arabian Sea. Fishermen are advised not to venture into the sea along Lakshadweep area, southwest, central and north Arabian Sea, according to a statement issued by the India Meteorological Department. A group of Dalits under the aegis of the All Kerala Pulayar Mahasabha have complained to the Chief Minister alleging that members of the Christian community had humiliated them at the relief camp functioning at Anjilimoodu LP School in Pallippadu panchayat near Haripad. After refusing to share space and food prepared by SCs, members of the Christian community had moved to another camp, they alleged. However, panchayat member T K Sujatha claimed it was a non-issue. “These are politically motivated charges. No caste discrimination has taken place at the camp,” Sujatha said. Palakkad: The shutters of the Aliyar dam in Tamil Nadu were opened for the first time this season on Saturday, which increased the inflow into the Chitturpuzha. “As work was in progress at the Moolathara regulator and left-bank canal of the Chitturpuzha, the Kerala government has given an operational plan to TN to maintain the water level in the dam at 1,046.50 feet, which has been agreed to. As per the plan submitted by Kerala, TN will regulate the release of water to 5,000 cusecs. The full reservoir level is 1,050 feet,” said Joint Water Regulatory Development Board deputy director Sudheer Padikkal.